In this episode I talk to Dr Carrie Birch, who completed a PhD in education in 2010. Carrie did her PhD part time at the University of Sheffield, and it was really interesting to talk to her about what she did for her PhD and how she did it. You can find her on Twitter as @carriebirch. In the podcast Carrie mentions some articles that she read to help her prepare for the viva; she has been kind enough to send me a list to share here. Leshem, S. (2007). Thinking about conceptual frameworks in a research community of practice: a case of a doctoral programme. Innovations in Education and Teaching International 44(3). Leshem, S., & Trafford, V. (2007). Overlooking the conceptual framework Innovations in Education and Teaching International, 44(1), 93-105. Pearce, L. (2005). How to examine a thesis. Maidenhead: Open University – McGraw-Hill. Trafford, V. (2003). ‘Questions in Doctoral Vivas: Views from the Inside’. Quality Assurance in Education, 11(2), 114 -122. Trafford, V., & Leshem, S. (2008). Stepping stones to achieving your doctorate. Maidenhead: Open University Press-McGraw-Hill. Trafford, V., & Leshem, S. (2009). Doctorateness as a threshold concept. Innovations in Education and Teaching International, 46(3). If you have any comments or questions then please get in touch: follow @VivaSurvivors on Twitter, or email me. If you would like to share your viva story then definitely get in touch! 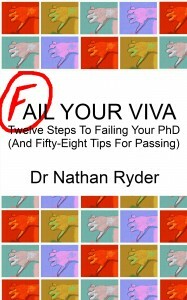 And if you have your viva coming up, take a look at my first book, “Fail Your Viva – Twelve Steps To Failing The PhD (And Fifty-Eight Tips For Passing)” – on sale exclusively in the Kindle Store for now, but a print-on-demand edition is coming! Dr Claire Savy did her PhD in neurotoxicology at Newcastle University, and her viva was less than a month ago! She is currently working at the University of Leeds as a Researcher Training and Development Project Officer; Claire is working on the organisation of the Postgraduate Research Conference and is responsible for the Thesis Twitter Conference and the conference’s Twitter feed: @UoLPGconference. Claire had a lot of great advice on viva preparation. She spent a lot of time preparing, and I know that people are going to find her story valuable – particularly practising answering questions out loud to get used to talking about her thesis in a certain way. If you have questions or comments about this or any of the podcasts then please get in touch, either through the comments, on email or via the Viva Survivors Twitter account: @VivaSurvivors.